The first time I ever cooked Thanksgiving dinner on my own was for my soon to be in-laws in their tiny 9x7 kitchen with no counter space. Saying that I was "stressed" was an understatement. I think my husband used the term "manic". I'm not certain if my personality shined and made a good impression on them that day, but thankfully my food did. And every Thanksgiving since, my husband compares my cooking to the first time--his all-time favorite. The big hit of my Thanksgiving dinner was my pumpkin soup--the centerpiece of the table. I think that they were all quite surprised when I placed a large pumpkin on the table and started ladling soup into their bowls. For some reason, I haven't made pumpkin soup since for Thanksgiving, but plan to this year. We're planning on having a small gathering of only four people for Thanksgiving and so I plan to use individual roasted "sugar pie" pumpkins for bowls. Now, I don't recommend using the individual pumpkins if you're having a large group of people because it would be very time consuming to carve out each pumpkin. So go with either one large pumpkin, or skip the pumpkin altogether and ladle it into the soup bowls and garnish. Regardless of how you serve it, this soup will be delicious and make a beautiful presentation for your guests. Note: If you plan to use individual pumpkins, pre-heat oven to 400 degrees. Rub pumpkins with olive oil and sprinkle with salt and pepper. Roast for 30-40 minutes until just tender. Let cool, cut off top and scoop out seeds. In a large dutch oven or pot, heat olive oil on medium-low heat. Add sliced onions and garlic and cook until tender. Deglaze with sparkling cider and cook until most liquid is absorbed and onions are sweet and creamy. Add pumpkin puree, sage, 5-6 cups vegetable stock and salt and pepper to taste. I prefer a thinner soup, but if you like it thicker, add less stock. Also, as the soup cooks and sits, it will thicken on its own. Stir to combine and bring to a boil and reduce to a simmer and cook for about 15 minutes for flavors to combine. Place soup in a blender and blend on high until smooth, adding more stock if necessary to reach the desired consistency. For additional sweetness add a little more apple cider if needed. 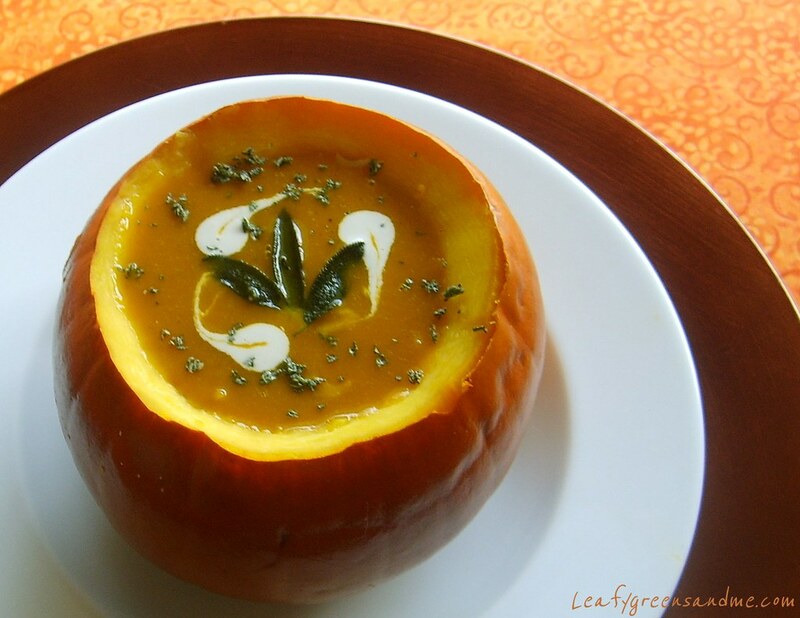 Ladle soup into prepared pumpkins or soup bowls and garnish with fried sage leaves, apple cider cream and minced sage. Pass additional cider cream to your guests--it's totally yummy! Drain cashews and place in a blender. Cover with sparkling cider just to cover nuts and blend on high for about four minutes until creamy. Strain and chill until ready to use. For the fried sage leaves, heat a small amount of olive oil in a saute plan, add leaves and cook on both sides for about 1 minute or less. Drain on paper towels and sprinkle with kosher salt. I'm the Social Media Coordinator for Martinelli's, and I came across this recipe this morning. May I say that it sounds and looks absolutely delicious. I just wanted to let you know that I posted a link to this on the Martinelli's Facebook and Twitter pages (http://www.facebook.com/MartinellisCo and twitter.com/MartinellisCo). Social Media Coordinator - S. Martinelli & Co.